Most states require a minimum number of supervised hours behind the wheel before a teen driver can progress from the learner stage to their intermediate license. Depending on your state, that’s anywhere between 0 to 70 hours of required time, but 50 hours is the norm. 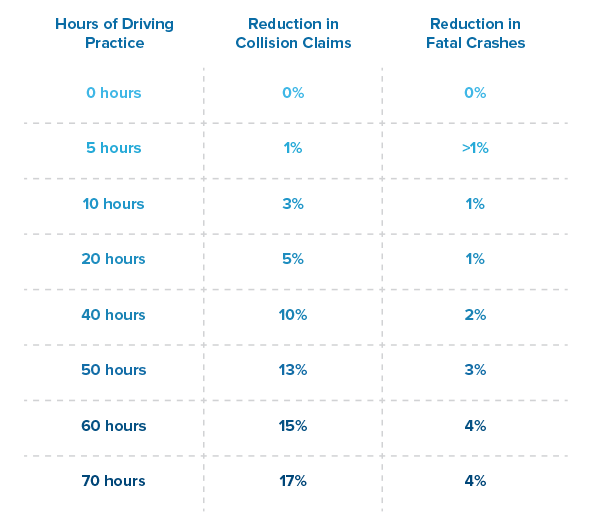 Research shows that the more hours of supervised practice a driver gets, the less likely they are to get into a collision. This means that having your teen receive their license without enough practice is dangerous for them and others on the road. There are no shortcuts or hacks here. Just an issue of more is better and time takes time. We have 5 tips to help you manage. Implementing structure is an important part in meeting goals. To reach 50 hours of practice drive time in 6 months, you’ll need to allocate at least 2 hours a week. Make a recurring appointment on your calendar for when that will fit. Is it an hour after soccer practice on Wednesday plus an hour on Sunday before lunch? Is that 2 hours every Saturday afternoon before grocery shopping? Fit it in around activities that you currently do so that it becomes a part of your routine. It takes a village. You are busy, your teen is busy. It’s going to be difficult to coordinate your schedules to add this extra task. Make plans to share the responsibility with your partner. Perhaps you should put that Sunday-before-lunch session on his or her calendar. DRVN makes it easy for your partner to pick up on the skills where you left off. There will be scheduling conflicts for you, and there will be scheduling conflicts for your teen. However, if you have to cancel a practice driving session, make sure you can reschedule it for another time that week or be prepared to make the other session two hours. Driving is an important skill to develop, and it takes time to do so. Make sure to hold each other accountable. This seems obvious, but we thought you should see the stats. For every hour of driving practice your teen gets, you reduce your risk of collision claims and fatal crashes. People sometimes don’t stick to their goals because there are no immediate ramifications when they don’t. Create a negative incentive. If you can’t think of anything, try StickK. It’s an online commitment contract service that holds your money and then donates to an “anti-charity” of your choice if you don’t stick to your goal. That’s right, you can donate to the rival team if you don’t follow through. DRVN will remind you and help you track and optimize your time, but it’s still on you to make the time. Two hours a week —you can do it! Just put it on the calendar and stick to it.